Ideal for maintenance crews and do-it-yourselfers. The proper sand and water is already added. Simply stir, pour, and apply by soft rubber squeegee. Approximately .12 to .15 gallons per square yard per coat. 100% acrylic tennis court coating designed for tennis, athletic courts, and other sport and recreational pavement. Ready-Mix Color is a 100% acrylic emulsion coating designed for tennis courts and other sport and recreational pavement surfaces. Ready-Mix Color is fortified with sand for slip resistance and wearability. Tennis courts, basketball courts, athletic courts, playgrounds, and other asphalt or concrete recreational surfaces. Do It Yourself (DIY) friendly. Pavement surface must be cleaned entirely of dust, dirt, debris and all loose materials. Repair of pavement surface defects, depressions, and cracks must be completed prior to application. All repairs must be flush and smooth to adjoining surfaces. Do not use asphalt-based, crack fillers with this or any acrylic tennis court coating. For best results, use with acrylic-based crack repair products. New asphalt surfaces must cure 14 to 28 days prior to application. It is recommended that any uncoated asphalt surface receive one or more coats of Acrylic Resurfacer (Technical Bulletin CMT- 3) as required by surface roughness and porosity to provide a smooth, dense underlayment for application of tennis court coatings and paint. New concrete surfaces must cure 28 days prior to application. Concrete surfaces should have a medium broom finish or similar roughened texture. They must never be steel trowelled. Etch surface with Muriatic or Phosphoric Acid and apply SportMaster Acrylic SportMaster Adhesion Promoter prior to coating with tennis court paint. Ready-Mix Color is ready to use. Do not add water. Stir thoroughly prior to application. Apply Ready-Mix Color with a soft rubber squeegee. Allow two to four hours drying time between coats. Two coats are recommended. Ready-Mix Color dries in 30 to 60 minutes under optimum drying conditions. Allow 48 hours before allowing foot traffic or play. Wash tools in water before material dries. If allowed to dry,tennis court coating can be removed from tools with water and wire brush. 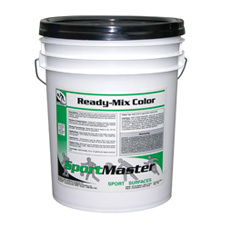 Contact your SportMaster representative if you have further questions on Ready Mix Color, tennis court paint, tennis court coatings, or do it yourself (DIY) products. Qualified tennis court contractors are available nationwide. Ask us for contractor referrals and to receive free estimates on your court construction, repair, or resurfacing project. View in Catalog 5 gal. Pail 60 lbs.